More than 200 authentic artifacts and memorabilia representing many facets of African American culture, including items from the slavery era; stage outfits of prominent entertainers such as Luther Vandross, Jimi Hendrix and Bootsy Collins, and notable items from innovators and visionaries such as Dr. Martin Luther King, Jr. and Malcolm X, have been included in “America I Am,” a traveling museum exhibit currently running through May 1st at the National Geographic Museum in Washington, D.C., and moving to other locations later this year. You can find more information about the exhibit at AmericaIAm.org and The Washington Informer. The Black Ensemble Theater is producing a new play called All In Love Is Fair, featuring the music of Luther Vandross as well as songs made popular by Brook Benton, James Ingram, Gladys Knight and Roberta Flack. The play will run at the ensemble’s theater in Chicago from March 12th to May 8th. The show tells a story of how the people that live in a fictitious multi-cultural town of Love, Illinois, move in and out of love. For more information and tickets, visit TheaterMania.com. The Legacy team has been doing their daily posts of songs from various artists. Today, Luther Vandross gets the nod for “Never Too Much” and added a little copy to accompany the track. Feel free to visit LegacyRecordings.com to listen to the track, but we are going to post the video here, on Luther’s site. In the name of true Valentine’s Day happiness, we decided to have a little fun with Mariah Carey and Luther Vandross’, “ Endless Love“, from Mariah’s The Ballads CD. Fill in the blanks and get as creative as you can! Play with a friend or by yourself, and see what funny new song lyrics you can come up with. Then, share your creations in the comments section. 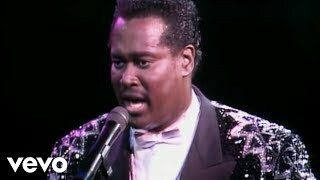 Welcome to the new LutherVandross.com. We’ve launched a new site to help you – the fans – connect with one another. Please visit the Luther Vandross forum and create a new profile. Also, please use the forum to tell us what you’d like to see on the site.